Over the period of time, the Evernote app got more and more features built into it, which would take some time for a new user to understand and be productive. Though Evernote is no longer provides all of its features for free users, it is providing a couple of plans which users might opt in to get all those features. Its premium plan costs around $7.99/month and the business plan costs around $14.99/month. Thus to have a fresh experience and to explore other apps which certainly provide noteworthy features related to jotting down your notes. Unlike Evernote, the following apps are also focused on a few other features to support a new category of users. 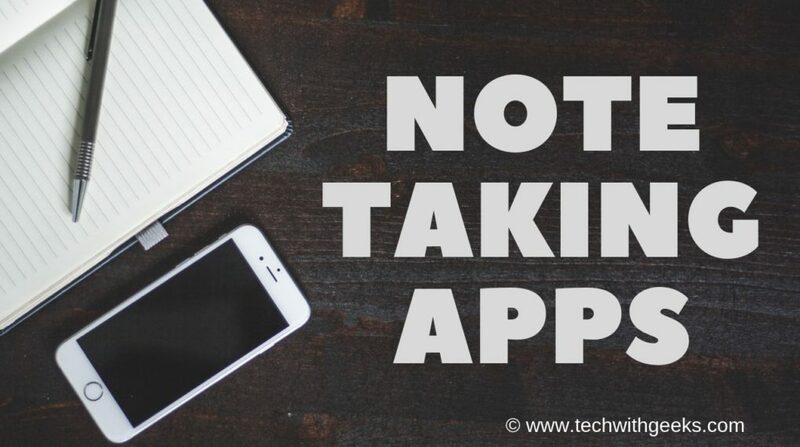 Well, most of the notes apps serve a single purpose which is adding notes, while we discuss here some of the apps which serves beyond the main purpose, while few apps focus on just basic options and others focus on management of projects and much more. Bear Notes on the wishful app for iOS providing aesthetic note-taking features. Its main focus was on maintaining the simplicity while also preserving the main usage of jotting down the notes with its markup options. Your notes are stored in parallel blocks, upon sliding the note block to the left, you get options to Pin the note, delete or even add attachments. Bear notes for iOS is applauded well for its UI and feature implementations to bring out the best from writers. Speaking about the UI, the implementation of colors into this app has been well done. One can easily change the colors for headlines, in the notes to any words/sentences and to even the note’s background itself which sounds and look beautiful. The management of notes and the categorization with labels and hashtags can be fairly conceivable. Download: Bear Notes For iOS. Trello is, in fact, a project management tool but it does provide a lot of features for an individual to use it as an alternative to other note taking apps. Unlike any other note-taking app, Trello provides a very unique dashboard consisting of boards which serve as a block or set of notes under one category. Trello basically has all the note-taking tools, such as the insertion of hyperlinks, metadata, media, etc. You can invite members to access a single or even multiple notes and provide their inputs, comments and the activity or log is shown below the note. All the notes and boards are synced and can be accessed on the mobile apps which are available for both iOS and Android. It is, in fact, the great management tool, it has a huge number of integrations with many other applications. Trello is easy to use, as the dashboard is easily manageable and can even drag and drop to make sure the boards go with your priorities. You can set reminders, even sync those reminders with your calendar app. Download: Trello For iOS| Android. Dropbox Paper has been introduced to the market as an intuitive app for solving communications between a team and making their projects progress faster. Unlike to the given reason above, here individuals can also use Dropbox Paper as an alternative to Evernote or even google notes. One can easily share the notes from the Dropbox Paper or even assign the note directly. Dropbox Paper for iOS and Android is easy to install, and even manage the tasks, assign tasks to your team and cross-check the progress. Their text editor even allows inserting images, videos, and soundtracks. What makes it a viable alternative is that it supports creating tables, inserting animations, gifs, hyperlinks, metadata, and even embedded videos without even need of formatting the text. Download: Dropbox Paper For iOS| Android. Google Keep is one of the intuitive note-taking apps, which works flawlessly across multiple devices. It is as popular as Evernote but lacks a big if compared to that of Evernote’s features. Keep is all about simple and minimal features that one can use to differentiate the notes, and also update them to their other devices with the use of cloud-based operating. Google Keep provides features with which one can easily differentiate their categories of notes, based on labels, colors, tags, and pins. Google’s material design and their snappy features let you to quickly jot down your text notes, voice notes, picture notes and much more. Some of its well-known features are OCR tool (which is useful to grab text from an image and directly add it into the notes), Collaboration (adding peoples to monitor the notes). Download: Google Keep For iOS | Android | Chrome (Extension) | Web. Zoho Notebook or mainly called Notebook from Zoho prepared strictly to replace the need for a sticky or any notes taking apps with itself. They have successfully released the Notebook for almost all the devices and OS. Zoho worked cleverly here by minding the reviews, and the feedback they got from the blog which was essentially shaped into the new features and solving the bugs. The notebook seems to be appealing for all, intrusive and yet provides flexible options to carry forward the momentum. Some of its core features are the books system like a folder of notes falls into a single board, audio notes, and most importantly drawing or sketching feature. Zoho syncs the data and updates very quickly which so impressed us, while we tried all of the Zoho apps on various platforms. Download: Zoho Notebook For iOS | Android | Chrome (Extension) | Web. We have shared some of the best note-taking apps for iOS which are unique to each other providing features useful for a writer and for a regular user. Let us know in the comments you think is the best note taking app you have experienced. We would love to know them.